Since starting a blog five or so years ago, I have primarily written about music. Whether it was general interest, the Pavement oeuvre, or a history of my concert-going experiences, my blogs tended to be about music. For a time, I dabbled with a beer blog, but I never fully incorporated beer into what I do until this blog happened. Even on this blog, I’ve probably written more posts on music than beer, but it’s getting close. Over the last year+, I have read and commented on blogs all over the internets. What I found in doing so was that different sites gave different results. If I commented on a music blog or site (when available), there was either no response or I was met with record store clerk condescension. On top of that, I could rarely count on anyone – bloggers or commenters – following me back to this blog to join our conversation here. When I visit and comment on beer blogs, the exact opposite happens. There are thoughtful responses to comments. Discussions happen. On more than one occasion, the bloggers and commenters at these other sites follow me here and contribute to the comments. Several have even linked back to this blog. The beer blogging community is a friendly lot. Then, there’s the traffic. My music posts barely come close to garnering as many views as most of my beer posts. When people go looking for music blogs, they want something more immediate, more polished than what I have to offer. I’m not in this for the traffic, but it gives me some kind of barometer for what people want to read. So, this blog is turning into more of a beer blog every day. I’m okay with that, but I won’t stop with the music posts. I like your beer stories and analysis. I don’t know what the hell you’re talking about and have never heard of one of the bands you have ever mentioned, ever. But I still read them. Tomorrow, I’m going to meet Michael Whip Wilton, the guitarist for Queensryche, at Total Wine. Apparently he has a beer named Whip Ale. 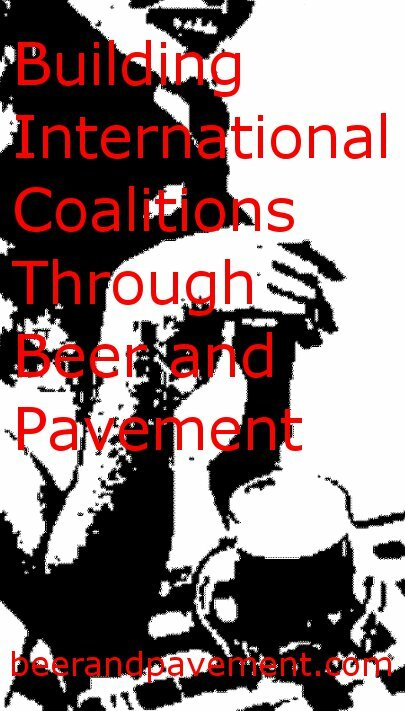 Is QR pavement enough b/c he does have beer, the music and beer marriage. Or is my analogy flat, like Nirvana and beer ever going together or something? Queensryche is not “pavement” enough, but I’m glad you’re going to meet Whip. That sounds pretty cool. Does he brew his own beer or does someone else brew it for him? Thanks for reading all of my posts, BTW. I think he might have brewed it first, but it’s pretty big now. He has Diamond Knot brewing it for him. I’ve only been blogging on both of these topics for half a year, and I have had the same results. Additionally, I find it more time consuming to write music posts. If I want to review a new album, I have to listen to it for multiple days and gather my thoughts about it. If I want to write about beer, I put all of my initial thoughts down on a piece of paper, and then enjoy the rest of the bottle and put a few more insights down while I consume the rest. It can take somewhere between 15-30 minutes. So beer blogging is a lot easier to write as well. This is an excellent point. However, I have been known to write a review of a record as I listen. Those reviews aren’t as good or I already have another related topic to write about. My beer reviews are actually more difficult to write as I go off on tangents and get away from the beers themselves. I suppose that has more to do with my lack of confidence in my beer writing. Still, it’s good to have at least one other blog do the same thing as I am. I’m not alone, I guess. Well I’m glad to have found your blog, as I kind of consider yours as a mentor blog. Maybe one day I can actual combine my two loves like you do in your posts. The hybrid blog posts are the most fun, but sometimes they take the most time to figure out and I end up short-changing one area or the other, sometimes the entire post.